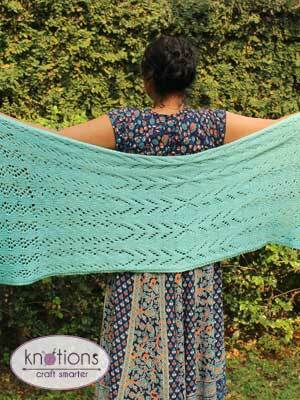 A Time of Rain is a rectangular lace shawl worked in DK yarn. 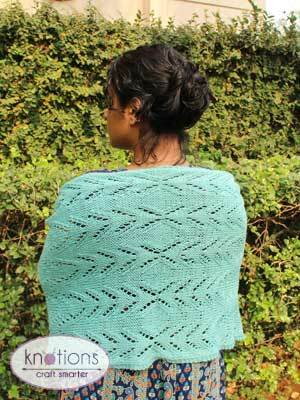 This is an easy, relaxing knit – small stitch multiples, no shaping, and no patterning on WS rows all add to speed of knitting! The design can also be sized down to make a scarf. 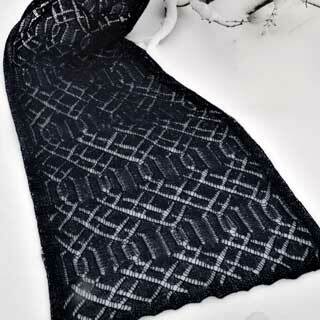 The shawl body has 3 sections each with its own lace pattern. When draped vertically, the first and second sections bring to mind twin streams of droplets falling from the tips of leaves. In the third section, the droplets join to form columns of larger and rounder drops which fall to the ground. The delicate leaf edging adds a feminine touch. 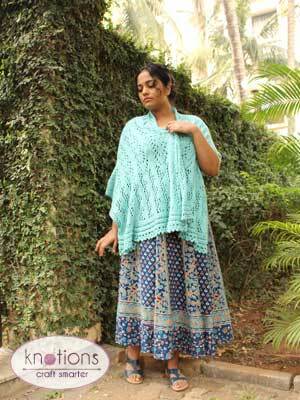 The idea for this shawl came to me during last year’s monsoon season in Mumbai. Torrential rains outside my window and the sight of sprigs and branches bursting into vivid green made me think of translating leaves and water into lace. 68” long and 25” wide. Note: schematic is not to scale. 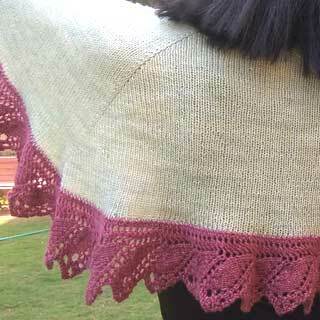 Thanks to Webs for the yarn support for this pattern. 16 sts and 20 rows = 4” [10 cm] in St st after wet blocking. 15 sts and 18 rows = 4” [10 cm] in Pattern 1 after wet blocking. The shawl begins with a provisional CO with waste yarn at the center from which two halves are worked outwards towards either side. The halves are designated A and B for clarity. There are 3 lace patterns for the body. A 3-stitch garter border is added along the long edges. This border is not included in the charts. The leaf edging is knitted-on sideways. For ease of counting, it is recommended that lifelines are used after every pattern repeat and left in place until the end of work. 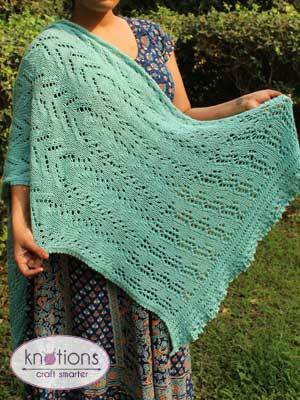 This chart is designed to be a mirror image of chart 4A when the shawl is worn with ends hanging vertically. April 11, 2019 – We fixed the stitch count after the setup row. Using provisional CO method of choice and waste yarn, CO 86 sts. This design used a provisional CO with a crochet hook. Work 5 repeats of pattern both horizontally and vertically. R1(RS): K3, *k4, k2tog, k1, yo, k2, yo, k1, ssk, k4. Rep from *across row until 3 sts rem, k3. R2 (and all even numbered rows) (WS): K3, p across row, end k3. R3: K3, *k3, k2tog, k1, yo, k4, yo, k1, ssk, k3. Rep from *across row until 3 sts rem, k3. R5: K3, *k2, k2tog, k1, yo, k6, yo, k1, ssk, k2. Rep from *across row until 3 sts rem, k3. R7: K3, *k1, k2tog, k1, yo, k8, yo, k1, ssk, k1. Rep from *across row until 3 sts rem, k3. Work 5 repeats of pattern horizontally and 7 repeats vertically. Work the below written instructions of follow the above chart. R1(RS): K3, *k4, yo, k2, yo, k2, k2tog, ssk, k2, yo, k4. Rep from *across row until 3 sts rem, k3. R3: K3, *k3, yo, k2, k2tog, k2, ssk, k2, yo, k3. Rep from *across row until 3 sts rem, k3. R5: K3, *k2, yo, k2, k2tog, k4, ssk, k2, yo, k2. Rep from *across row until 3 sts rem, k3. R7: K3, *k1, yo, k2, k2tog, k6, ssk, k2, yo, k1. Rep from *across row until 3 sts rem, k3. Work 10 repeats of pattern horizontally and 4 repeats vertically. Work the below written instructions of follow the above chart. For the first repeat, begin with R2 (R8 of Pattern 2 is counted as R1 of Pattern 3). For subsequent repeats, follow pattern as usual. R1 (and all odd numbered rows) (WS): K3, p across row, end k3. R2 (RS): K3, *k1, (k2tog, yo) three times, k1. Rep from *across row until 3 sts rem, k3. R4: K3, *k1, (k2tog, yo) twice, k3. Rep from *across row until 3 sts rem, k3. R6: K3, *k2, k2tog, yo, k4. Rep from *across row until 3 sts rem, k3. Set up row 1 (WS): Purl all sts including the border sts. Place a lifeline to mark the lower edge of the shawl body. Set up row 2 (RS): CO 11 sts at the right edge, using the knitted CO. K 10 sts and work the last st of the edging along with the adjacent st of the body (held on lifeline) as k2tog. On all RS rows, work the last st of the edging along with the adjacent st of the body (held on lifeline) as k2tog, and slip it purlwise on the next WS row. Work the below written instructions of follow the above chart. R1 (WS): Sl 1 pwise, k2, (yo, ssk, k1) twice, (yo twice, k1) twice. R2 (RS): (K1, [k1, p1 into the double yo]) four times, k3. R3: Sl 1 pwise, k2, (yo, ssk, k1) twice, k6. R4: BO 4 sts (one st left on needle), k3, p1, k2, p1, k3. Work R1-4 of the edging 41 times. On R4 of the last repeat, work k3tog (last st of edging and last 2 sts of body) instead of k2tog. Turn to WS, BO using the lace BO in purl stitch (p2tog tbl, place st on right needle back on left needle, rep from * across row). Fasten off. Remove the waste yarn used for the provisional CO, and transfer the live sts to needle (86 sts). Work the body as given below. Work the above written instructions for section 1A or follow the chart above in the chart section. Work the above written instructions for section 2A or follow the chart above in the chart section. Work 10 repeats of pattern horizontally and 4 repeats vertically. Work either the below written instructions or follow the chart above for 3B. R2 (RS): K3, *k1, (yo, ssk) three times, k1. Rep from *across row until 3 sts rem, k3. R4: K3, *k3, (yo, ssk) twice, k1. Rep from *across row until 3 sts rem, k3. R6: K3, *k4, yo, ssk, k2. Rep from *across row until 3 sts rem, k3. On all RS rows, work the last st of the edging along with the adjacent st of the body (held on lifeline) as k2tog, and slip it purlwise on the next WS row. Work the below written instructions or follow the chart above in the chart section. R1 (WS): Sl 1 pwise, k2, (yo, k2tog, k1) twice, (yo twice, k1) twice. R3: Sl 1 pwise, k2, (yo, k2tog, k1) twice, k6. Work R1-4 of the edging 41 times. On R4 of the last repeat, work k3tog (last st of edging and last 2 sts of body) instead of k2tog. Turn to WS, BO using the lace BO in purl st. Fasten off. Block shawl to size and weave in ends. You may choose to block the leaf edging to a rectangular shape (as in photos) or to stretch it horizontally for a flared look. For a 10” x 68” scarf, CO 38 sts (for 2 pattern multiples of Pattern 1A) and work the rest of the pattern as indicated for the shawl. 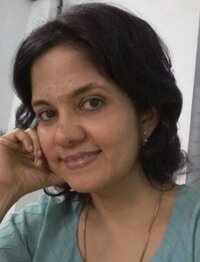 Padma likes to design wearables with a simple aesthetic which are fun to knit. Apart from knitting, her interests include crochet and Tunisian crochet – she finds it exciting to be able to switch from one craft to another. 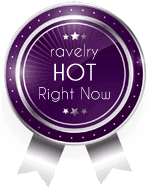 Her Ravelry user name is PadmaR and you can see her designs on her designer page. 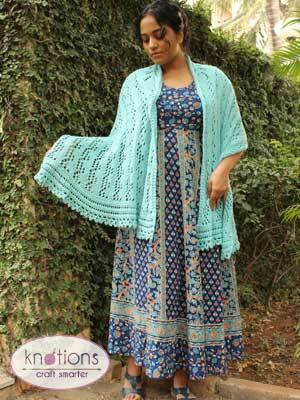 This is a beautiful shawl! I will be starting it soon. I really appreciate knowing the history, too! I do love all your patterns! Padma really designs some beautiful things, right? I assure you that’s not our intention! What are the issues? We’ll try to address them.